Doctorfish. Found in the Atlantic from Massachusetts to Brazil and in the northern Gulf of Mexico and the Caribbean, where it is most often eaten. It is a dark, often blue-grey to dark brown, but can change its colour and lighten considerably. This will depend on its habitat, being darker nearer reefs and paler over sandy bottoms. It has a sharp, scalpel like spine located on either side of the body on the caudal peduncle. The teeth, which can be seen in this photograph, are spatula-like in shapea dn are used for scraping algae off the rocks. They reach up 20 30 cm (12") in length. 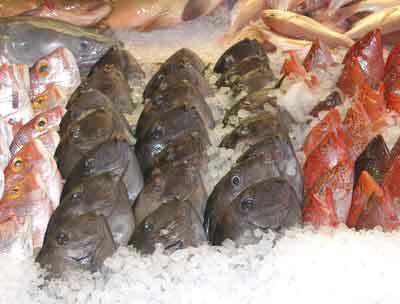 The flesh is of good quality but, if the fish have been feeding from dead corals or algae there is a faint possibility of some slight and temporary poisoning to the person who consumes the fish.